Last week, October Afternoon posted a challenge on its blog to use one of its lines two ways: make a project that follows the theme of that line and make another project with the same line that does not follow the theme. OA dubbed this challenge: theme/un-theme and I decided to play along. I was so excited this past Christmas when October Afternoon surprised us and came out with a holiday line. Yay! I bought it right up! I love Christmas and I love OA, so it worked out perfectly. One of my favorite things about October Afternoon is that the B sides of the paper are so versatile. As much as I love the A sides, I confess that I use the B sides a lot. And the un-themed B sides of Holiday Style were perfect for this challenge. For the theme/un-theme challenge, I used the A sides of Holiday Style to make a Christmas card and the B sides of the same line to make a Valentine card, repeating the stripe paper on both cards. 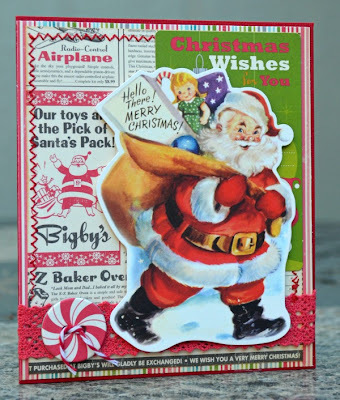 To make the Santa card, I layered 2 sheets of patterned paper together to make a card front, then added a strip of Holiday Style trim and a chipboard button along the bottom. I used a journaling card in the upper right to add a pop of color, then added the Santa icon from the Miscellany pack on top. 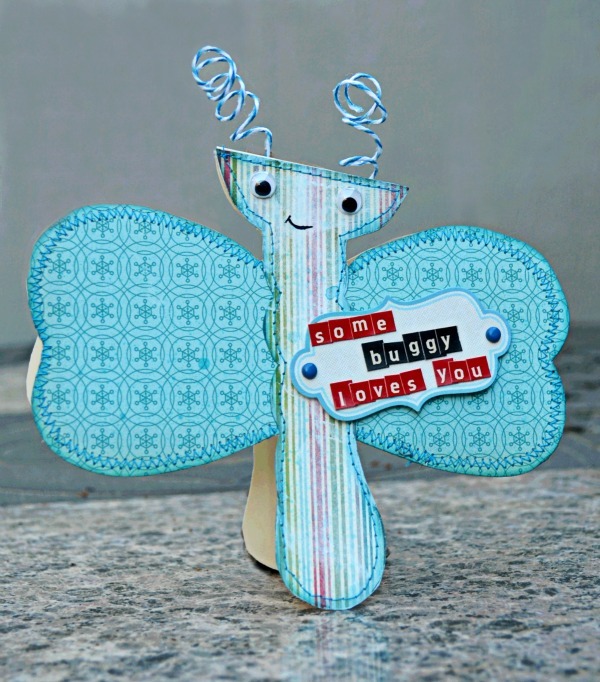 To make the Valentine, I hand-drew a dragonfly shape on cardstock, then covered it with patterned paper. To make the antennae, I stiffened twine with a glue gel medium and wrapped the twine around a pencil to get the curlicue shape. Want to play along? You can find out more about October Afternoon's theme/un-theme challenge on its blog here. 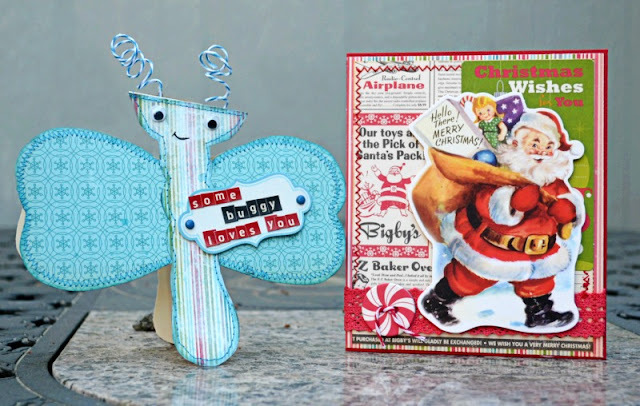 a-dorable...love your buggy shaped card and that christmas card is CUTE!! Love these! Especially the little bug! OMYGOSH!!! These are both ADORABLE! I loveeeeeeeee that little dragonfly and how you did the twine for the antennas!! Oh they are both adorable, so different! Very cute, especially love the Christmas one! Great work, as always. Love, love the bug and I LOVE October Afternoon! I'm still in love with that bug card you've made :) He is so cute! SO cute! LOVE the twisted twine antennae and the border stitching is expert!!!! I love OA b-sides too- many times I'll use those since I tend to like the color and pattern and I don't usually make themed projects- this is a great interpretation of the challenge. It's so hard to believe these came from the same collection. Awesome job! Cute cute cute work my friend! That Buggy card just gets me....so darn cute! Super cute and creative thinking too!!! Izzy, that dragonfly is so cute and the Trendy Twine looks perfect! I love OA too and saw this challenge. Awesome job with this, Izzy! Such a great challenge, and you rocked it! I am more of a B side scrapper, too. Cute cards! Great job with the challenge! I love both projects, they look great! What a versatile use of the same line! I still love the big cards! I've been holding on to the vintage Santa from that pack for a while. Now I know what to do with it.